More photos from my peregrinations. Real life has been intruding on my blogging time lately, so right now, despite having a head full of ideas that are driving me insane, I'm taking the easy way out and just posting some more photos I've taken with my new camera on several early morning and weekend walks over the past couple of weeks. 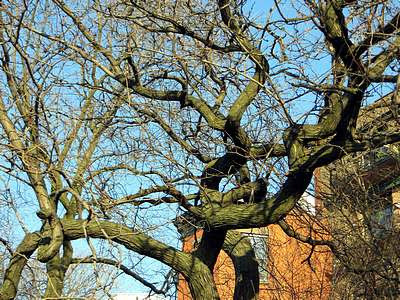 Above is a gnarly tree next to the Brooklyn Heights Promenade. The Chrysler Building (William Van Alen, 1930) was, until completion of the Empire State Building in 1931, the world's tallest building. 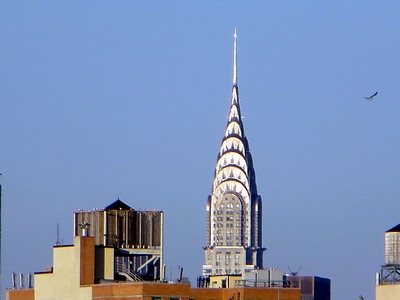 It is still the world's tallest steel-supported brick building, and one of the most spectacular examples of the art deco style. 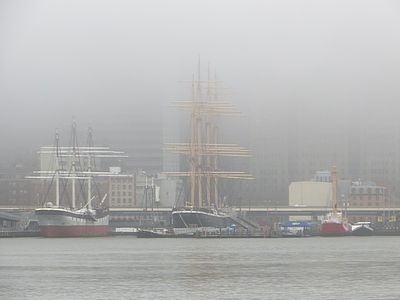 This photo was taken from Pier 1, Brooklyn Bridge Park, about three miles from the building. I'm very happy with my 20X zoom lens. Note the bird at the upper right of the photo. Probably a seagull, but possibly a red-tailed hawk. I've seen a hawk flying over the Brooklyn Bridge en route from Manhattan to Brooklyn. Why? 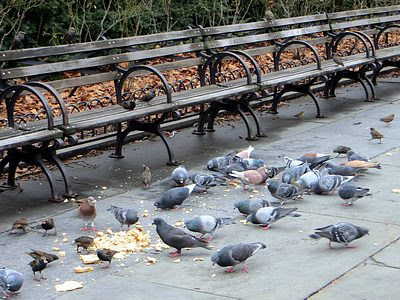 Just as these pigeons, and some starlings, are finding plentiful pickings in Brooklyn's Columbus Park, the hawks are finding plentiful prey here. 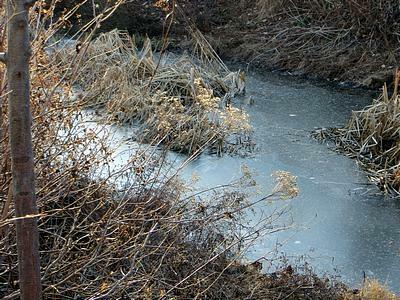 A frozen-over watercourse on the landward side of Pier 1, Brooklyn Bridge Park. 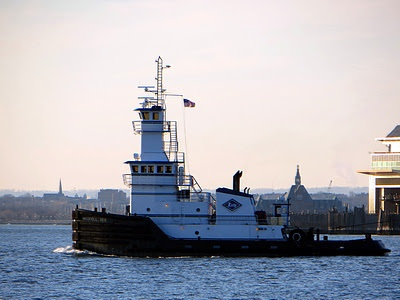 The tug Weddell Sea, with a barge in tow, heads out of the East River towards the Buttermilk Channel and lower New York Harbor. A Staten Island ferry, seen from Pier 5, Brooklyn Bridge Park, is docked at its Manhattan terminal. 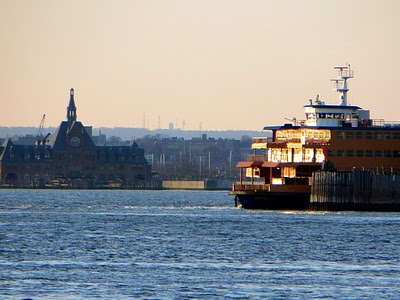 Beyond, at left, is the former Central Railroad of New Jersey station and ferry dock. Yet another view of the South Street Seaport Museum's fleet, this time in fog. 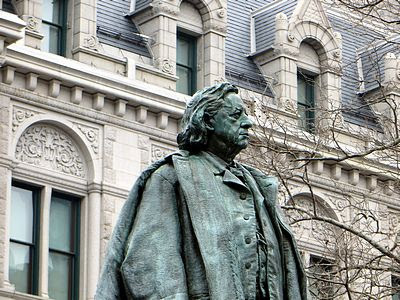 Statue of Henry Ward Beecher, by John Quincy Adams Ward (1891), at the north end of Columbus Park, Brooklyn. In the background is the Federal Building and Post Office (Mifflin E. Bell, also 1891), an excellent example of the romanesque revival style. 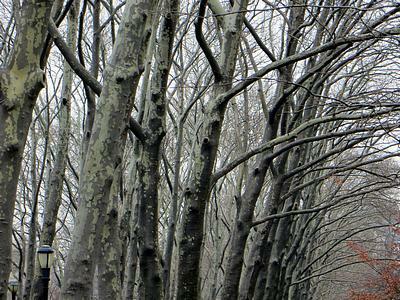 We started with a tree; we'll close with more bare trees along the east side of Cadman Plaza Park, Brooklyn.